The company running what it claims are the first tuk-tuks in the UK has been fined for operating them as taxis. 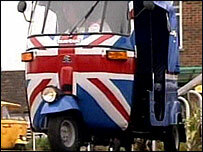 The 12 motorised three-wheeled rickshaws, which began running in Brighton in July, were supposed to be operated as buses with a timetable. The South East Traffic Commissioner said TucTuc Ltd failed to run to a timetable 50% of the time and fined the company the maximum penalty of £16,500. TucTuc said it would be appealing against the "excessive" fine. The company intended the Brighton operation to be a test-run before it launched the service in London next year. But complaints from taxi drivers led to a public inquiry being held last month. Commissioner Christopher Heaps said he found the company had not operated in accordance with its Public Service Vehicle Licence. But he added he would not stop TucTuc Ltd from operating because the company had amended its timetable to improve reliability. "We are absolutely delighted the traffic commissioner has decided the unique TucTuc service can keep its licence," said company director Dominic Ponniah. "Given that our service is the first of its kind, we understand that adjustments will need to be made along the way. "We will not be intimidated or bullied by the minority of disgruntled taxi drivers who failed to get their way at the public inquiry." The vehicles, which can go at speeds of up to 35 mph, are called tuk-tuks because of the sound their engines make. The Brighton fleet, imported from India, was given individual designs with designer uniforms for drivers. One design, the so-called Chavrolet in Burberry check, had to be withdrawn after Burberry's London office objected to a breach of its copyright.